I execute command that outputs LOTS of information through SSH. For example, I foolishly add debug information inside a loop that executes million times, or just run cat /dev/urandom for kicks. The terminal is flooded with information. I want to terminate the command ASAP and fix my program. I don't care what it prints. Now, the thing is that I press Ctrl+C ASAP (in the example above I pressed it immediately after running the command), but it still takes its time to print all the information I don't even need. I also read about Ctrl+S which apparently is used to tell terminal "stop output, I need to catch up" but apparently it does nothing. I'd like not to alter the command I run so I can rescue myself in any situation, even if I don't remember that the program I run could end up like that. My SSH client runs on Cygwin (CYGWIN_NT-6.1-WOW64 luna 1.7.30(0.272/5/3) 2014-05-23 10:36 i686 Cygwin) in MinTTY with terminal type set to xterm-256color. SSH server runs on Debian (Linux burza 3.2.0-4-686-pae #1 SMP Debian 3.2.51-1 i686 i686 i686 GNU/Linux). Some of that output will be buffered. You send your Ctrl+C to the remote end which interrupts the running program. The program exists and the shell send the characters to show you the prompt again. Before the prompt is shown your screen will first show all the data that was buffered and already on it's way to you. What you're asking is for the program to stop and the data in transit to somehow disappear. That can't happen as it's already en-route. The only way you can make sure that you don't see this data is to exit the terminal at your end and then re-connect to your remote - but that's probably far more effort than waiting for the buffered data to display. I usually run the output into less so that I can kill it via less instead using the q key. After hitting q+Enter it'll quit and return back to your normal terminal, leaving it nice and clean. 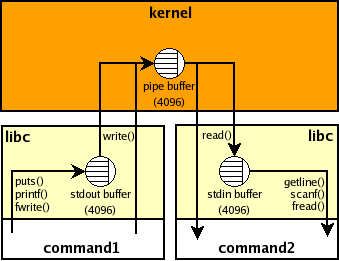 The problem you're encountering is that there are buffers (for STDOUT) that are being queued up with the output of your display. These buffers get filled so quickly that you're unable to interrupt it fast enough to stop it. option is invalid with standard input. For a nice background on how buffering works I highly suggest taking a look at this Pixel Beat articled titled: buffering in standard streams. It even includes nice pictures. There are several levels of buffering. When you press Ctrl+C, this stops the program from emitting data to the terminal. This doesn't affect data that the terminal emulator hasn't displayed yet. If you want this to just stop now, kill the terminal emulator. If you don't wish to do that, at least minimize the window; intelligent terminal emulators (such as xterm) will not map the window, which saves the X CPU time, so the garbage will finish displaying quicker. The X server has high priority, so this will make a big difference to your machine's responsiveness while xterm is processing the data in the background. When all this is going on in a remote shell, the lag is even worse, because the data produced by cat has to first go through the SSH connection. Your press of Ctrl+C also has to go through the SSH connection; it gets somewhat higher priority (it's sent out of band), but that still takes some time during which more output accumulates. There's no way to suppress data in transit short of closing the SSH connection (which you can do by pressing Enter then ~.). It should be enough to find a way to kill the cat command. For the following proposals you may need a second ssh connection open. Seldom CTRL+z can be more effective than CTRL+c: it can answer faster. After that you suspend the command you can kill it with kill %1 or whatever is its job number. This in the hope that you are still able to read anything from the screen (a flooding random binary text can easily mess up your characters set). As remembered by Gilles if you minimize the window probably the system will be faster to read the interrupt request than you to kill the process. So suspend/break, minimize, wait a little, maximize again, can be a solution too. Of course through an ssh connection I expect that you need however to wait some time. As just reported less is safer. I had the same problem and wasn't satisfied with the answers here so I dug deeper. Others have already mentioned your command is outputting data faster than your ssh can take, so the data buffers, and buffers can't be stopped. To fix this avoid buffering by throttling your command output to the maximum rate that your ssh session can take, commands already exist to do this. Finally, throttle your real commands accordingly. You may want to reduce the RATE a little in case your connection speed dips a little from time to time. If it dips, the behavior will return to issue, a non-responsive ctrl-c.
Now ctrl-c works as expected, immediately killing the output since very little if any is buffered. There's a software on Linux which solves exactly this problem (a couple of others things too). You can also invoke it from a terminal emulator in Windows (you seem to be using Windows?). Try mosh, a replacement for the SSH binary. It works exactly like SSH (you can do mosh user@hostname instead of ssh user@hostname and it would work exactly as you expect, will even do private key authentication etc. It basically runs a separate process on the server which buffers the packets. So when you press Ctrl+C on mosh, it will convey this to the remote server, which will then stop sending the extra information. In addition, it will also predict the result of keystrokes, saving you a couple of milliseconds every time you press a key. Downside: Currently it isn't possible to scroll up in history while using mosh. Not the answer you're looking for? Browse other questions tagged ssh terminal cygwin or ask your own question.